One of the most beautiful moments of being a parent is being able to tuck your little ones in for the night. Most parents I know have a set night time routine that helps get their babies to relax and to understand that the time for games is over for the day. Night time is also the best time for some one on one cuddles. I don’t know what I will do when they outgrow them. Our night time routine is pretty much set in stone. My husband and I run around with them after bath time to let them get that last bit of energy out. Then when it is time to start winding down, we sing a song and say a poem. The song I chose was one of my favorite songs from when I was growing up. It is a song by Topoyiyo called “A La Camita”. This song has been part of my life for as long as I can remember. We watched the show of this little silly mouse when I was little. When I was in high school it was the last song the played at night clubs across the border as a way to let people know it was closing time. I thought it was such a cute idea that we even chose it as the last song of our wedding reception. And now I am passing it on to my little ones. After that, each child goes into his own room and my husband and I tag team. He goes into my oldest’s room first and I go in with my little one. We each read them stories and sing songs. I sing to them in Spanish while my husband sings in English. The songs I sing are a montage of songs from a cd that that mom gave us from a group called Grupo Tihui from the album Arrullos Tradicionales De México. It was a gift and I could not find a link to it, sorry. I highly recommend it, however, if you can find it. It has magical powers. I would play it for both boys when they were infants and it would instantly calm them down. After we are done, we trade and do it all over again with the other child. Well, my oldest and I do shadow puppets for a bit then have a question and answer session where he asks me anything he can think of and I try to answer it to the best of my ability. (Thank goodness for google!) Last come our goodnight kisses for both and everyone goes to bed happy. 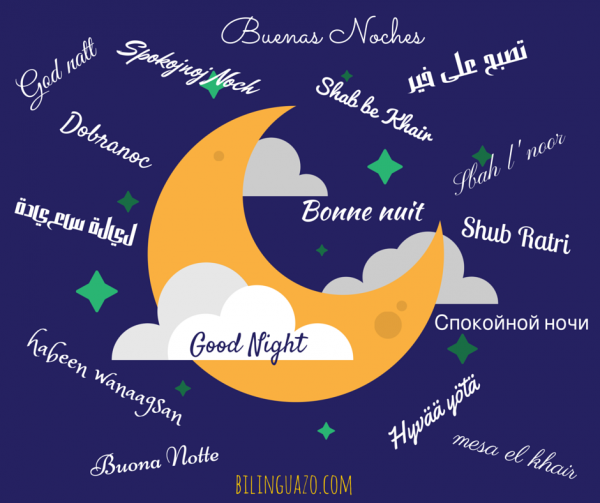 I thought it would be fun to see how the parents around the world on say goodnight, so I reached out to my friends at Multicultural Kid Blogs. Here is what they shared. One thing is universal, songs and lullabies are one of the most beautiful way to cuddle with your little one and teach them a little music while you are at it. Hope you enjoy! We read books and then kids go tho their beds, I tell them a story. They tell me who will be the story characters and I have to come up with the rest. If the kids are still up after the story, I sing to them. Our family says “Good night!” in three languages: “Buona Notte!” in Italian, “Spokojnoj Nochi!” ( Спокойной Ночи!) in Russian and “Good Night! in English. She also has a post about Russian lullabies (written in Russian) that you can find HERE. She even mentioned it on her post HERE. Both my husband and I put our little one to bed every night (she’s two). We take turns wishing her good night and sweet dreams in English and Spanish and she responds “I love you” to Daddy and “Te quiero mucho” to me. She puts her hands together (like in a prayer) … that’s our sign for “Bendicion” or bless me in Spanish and then I respond by saying “Dios te bendiga.” The last thing I say is what my mother always said to me “Que sueñes con los angelitos,” meaning “May you dream with the little angels.” I am from Venezuela and my husband is American, we live in Germany. Sometimes a bath, then jammies on, brush teeth, a few books and sometimes family prayer. Into the turbulette (a kind of sleeping bag for babies), doudou (stuffed animal), two cars (for my 2 year old Rémy) and a kiss! Good night or buenas noches! Haboona Abdullah Hussein (The Ramblings of a Saudi Wife) included that in Arabic people say in the evening “mesa el khair” (evening of good) and the reply is “mesa el noor” (evening of light). (In Russia, you say) Спокойной ночи (spokOJnoj nochi) which literally translates as have a calm night. Some kids love watching a kid tv show that runs right before the bedtime and has the same name. We live in the US now and will do shower/books/lie down in bed together/kisses and hugs and then goodnight in both English and Russian. In India of most us say Good night to kids after maybe reading their favorite book to them. But when my twins were 8 months old, I had started singing the Gayatri mantra for them. It is a chant that is considered very powerful, protecting and Peaceful. (Find link HERE) Although I had stopped, will start now. Good night in literal Hindi translation means- Shub Ratri. In urdu we say ‘shab-be-khair’ that means good/peaceful night. The lullabies sung at night are called ‘looris’. These are some great examples of how similar we all are no matter where we are from. Our babies are our lives, our hearts and souls. We will sing, read, and be silly for them for as long as they let us. Be free, and be happy and be as childlike as you can be. Enjoy every moment you can with those sweet little ones. My hope is that they will remember the silly times. Hopefully we will have the ability to carry it on for generations to come. I would love to hear your routines. 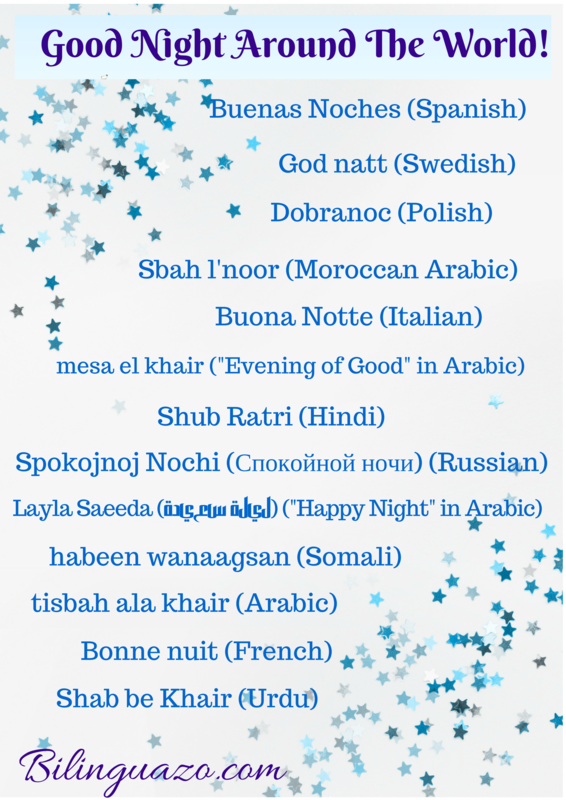 Thank you Multicultural Kids Blog families for letting me see into your traditions. I love learning from you all. Did you hear the news? The US has more Spanish speakers than Spain. This shouldn’t really come as a surprise due to the size and population differences between the two. What is amazing to see (for me at least) is how many Spanish speakers there actually are in the United States. A recent study conducted by Instituto Cervantes* found that there are 41 million native Spanish speakers in the US plus 11.6 million others who are bilingual. How awesome is that? 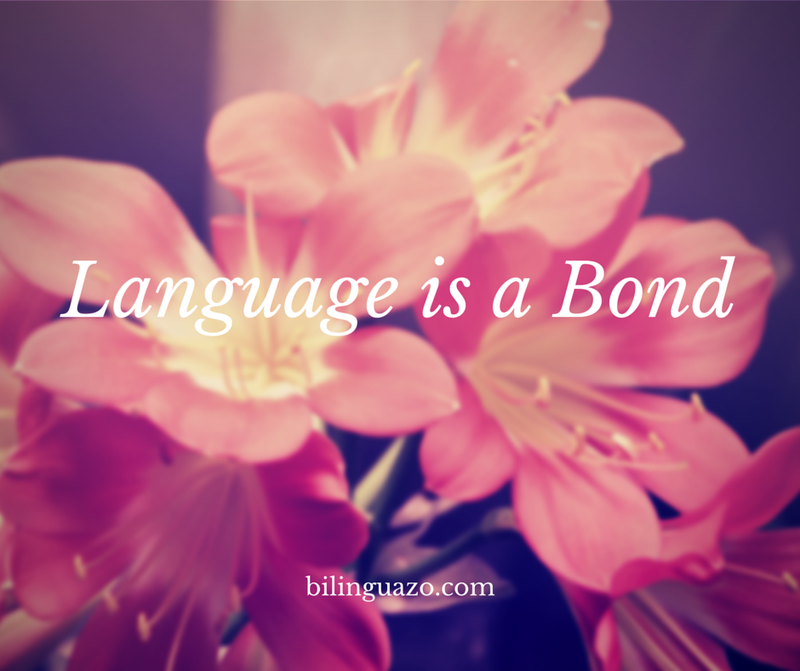 For me this means that I am not alone in wanting to teach my kids to speak, understand and love Spanish. There is an awesome community right outside my door. Thanks to someone special, we were able to put both boys in Spanish summer camp this year. M went last year on his own because T was too little. We thought T was ready this year. That is still up for debate. M loves school, comes home excited about the new words he learned that day, knows a lot of new songs and has made new friends. T cries every time we drop him off and on and off throughout the day. He hasn’t even bonded with his teacher or his classmates. I’m hoping this changes as they have 4 weeks to go. I really don’t like having him be so sad and would pull him if we didn’t think it may just be the terrible twos taking effect for not getting his way. What would you do? Once he gets past the tears, however, he does throw out some Spanish words without being asked. He also gets excited when we read books in Spanish at home and when we sing our songs. That makes me happy. We will keep trying with the summer program this coming week and revaluate at the end of it. But I digress. As far as Spanish always being a part of their lives, the new study gives me great hope. Also, with all of the attention being brought to our language and culture in the news today, it makes me proud to see how we have come together as a community no matter what part of the world we are come from. Spanish is our bond, family is our heart and pride is our power. All of these are great lessons for my boys in the long run. Let’s keep our love for languages alive! 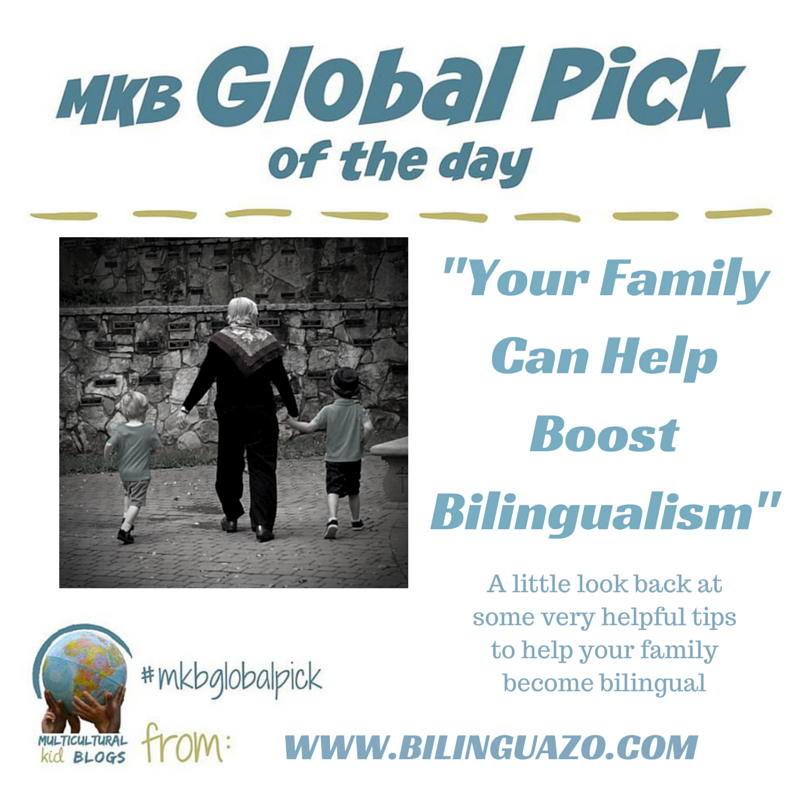 What languages do you speak with your kids? I’d love to learn more about your love for languages! Also, if you haven’t done so, please send a family pic. You do not have to include faces if you don’t want to…shadows, backs to the camera, hands held together, etc) for a fabulous future post. Thanks and have an amazing weekend. My Global Pick of the Day!! 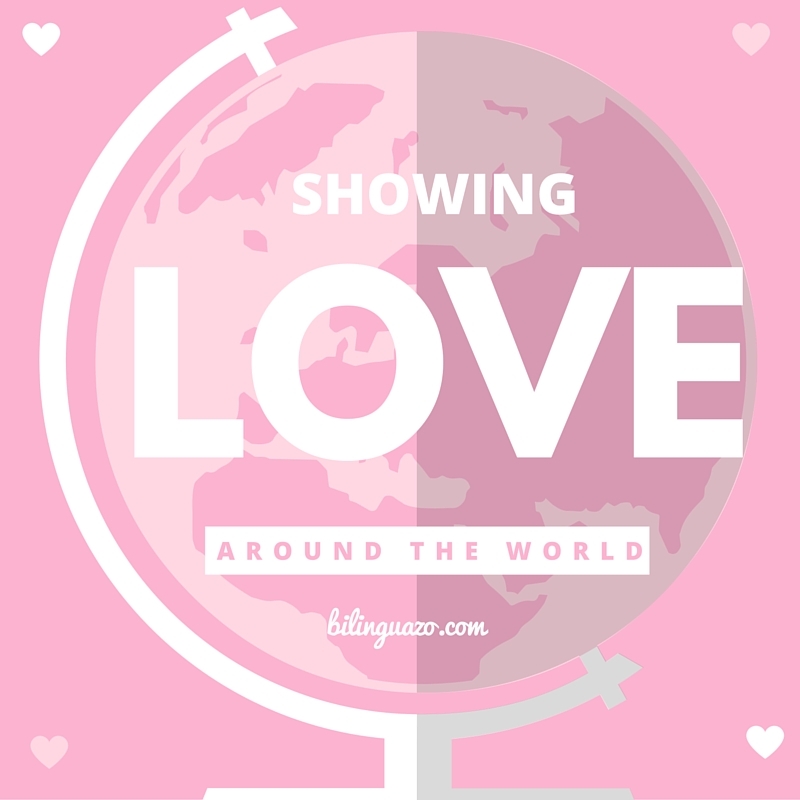 It is my turn to share one of my first posts with you and the Multicultural Kid Blogs readers. So I thought I would share with you one of my firsts post dealing with my greatest fear. It’s not snakes, dark spaces or even heights. I’m pretty good with all of these. What is it then? Public Speaking. Can’t do it, even at my age. What’s a mama to do? 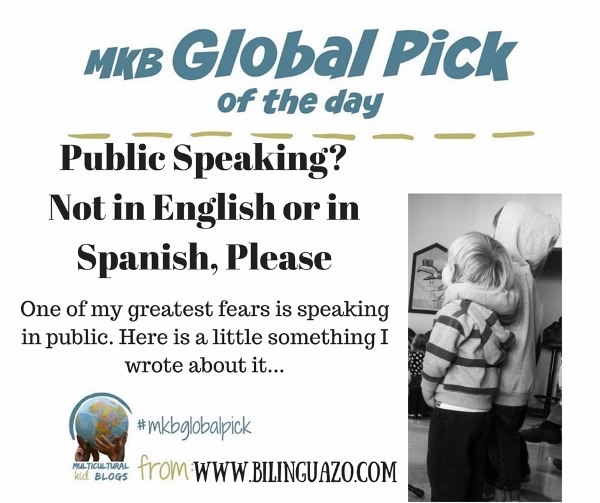 Public Speaking: Not in English or in Spanish, Please. I hope you enjoy my take on it and I would love suggestions on how to help my little ones avoid this challenge. 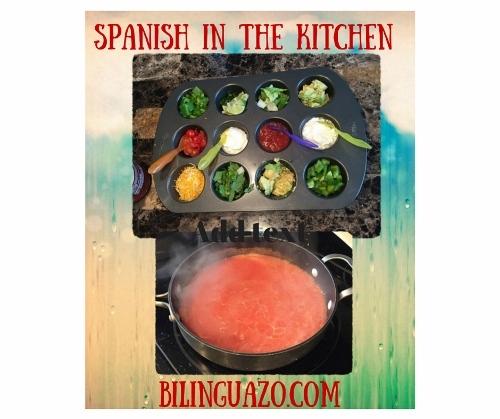 Yesterday was a great day for learning Spanish as well as delicious meals. I don’t know why I decided to experiment a little, but I’m glad I did. The boys were extremely happy with their meals and that doesn’t happen very often. There are days that one meal works and another doesn’t. There are also days that meal time can feel like it takes forever because they eat it so slowly. I can’t complain too much, though, at least they eat healthy. They always eat their fruits and veggies, thank goodness. For that reason I’m so glad we started them early on the love of healthy food. I am also very glad they like to try new foods even if I have to sell it a little. 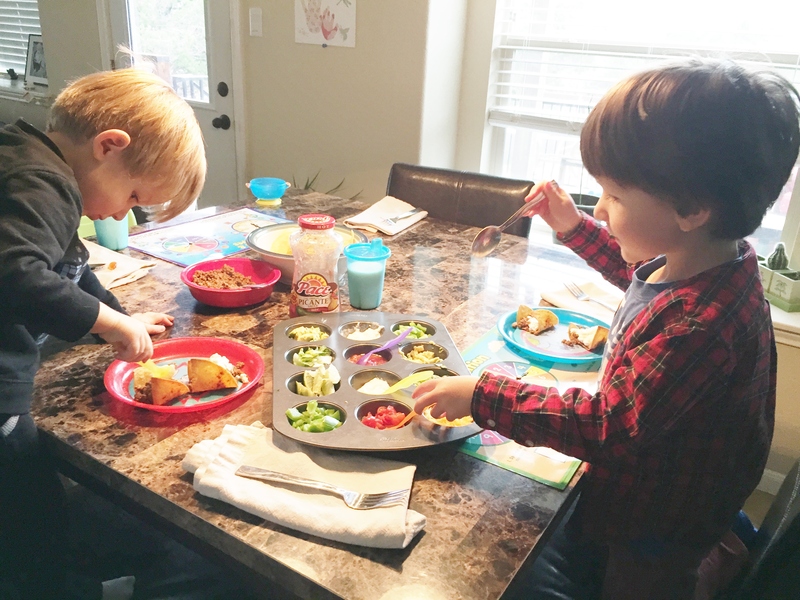 When I found these recipes online, I knew I had to share them with the boys. For lunch I decided to try a recipe I found for “sopa de fideo” which is a tomato based soup with thin noodles. You can use actual fideo noodles or if your grocery story doesn’t carry them, then you can just cut noodles you have. I used angle hair noodles and broke them into small pieces. 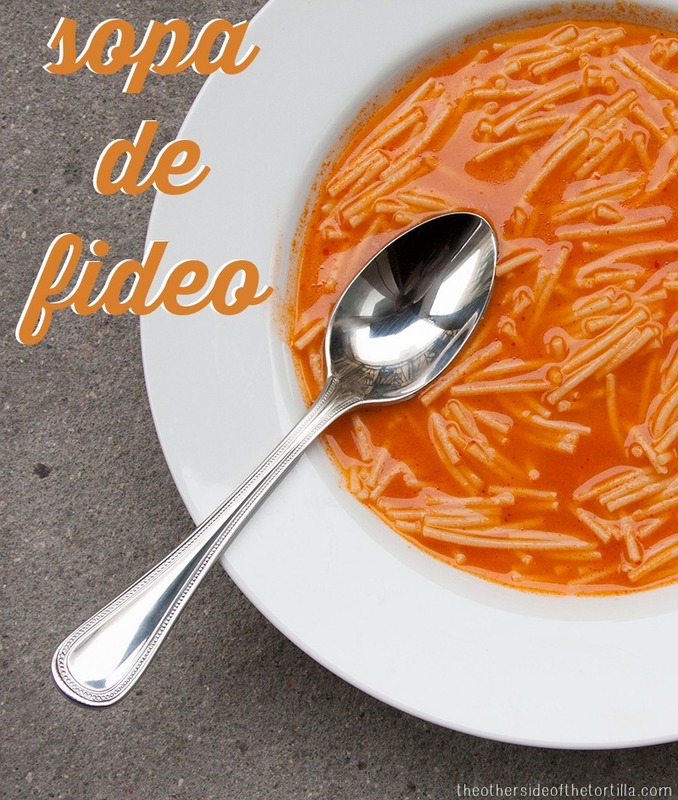 We would eat sopa de fideo a lot as kids. It brings back very lovely memories. This soup is one of those comfort foods that make you feel so warm and happy inside. I just had no idea how much work went into it at all. I should ask my mom her recipe for it to compare, but I must say this one was close. It makes me want to grow a bunch more tomato plants so I can make my own sauces and soups. I adjusted the recipe here a little as I didn’t have and don’t like onions and garlic (crazy, I know). Instead I added half a teaspoon of cumin which happens to be my favorite spice. As far as a teaching moment with this, I used the whole dining experience to tell them about how I grew up. We sat at the table and as we ate, I talked about Mexico and yummy food. We talked about family and how wonderful it was to bond in the kitchen and at the dining room table. We talked about how important it is to keep traditions alive even if they are just cooking or playing in the kitchen and family meals. In Mexico, my family has been known to sit for hours at the dining room table, chatting about our lives, laughing at each other jokes, reliving old memories and just being happy together. It wasn’t only a tasty meal, but one that made me feel a little closer to my boys. Then it was time for dinner. I let them play while I prepared the main components. 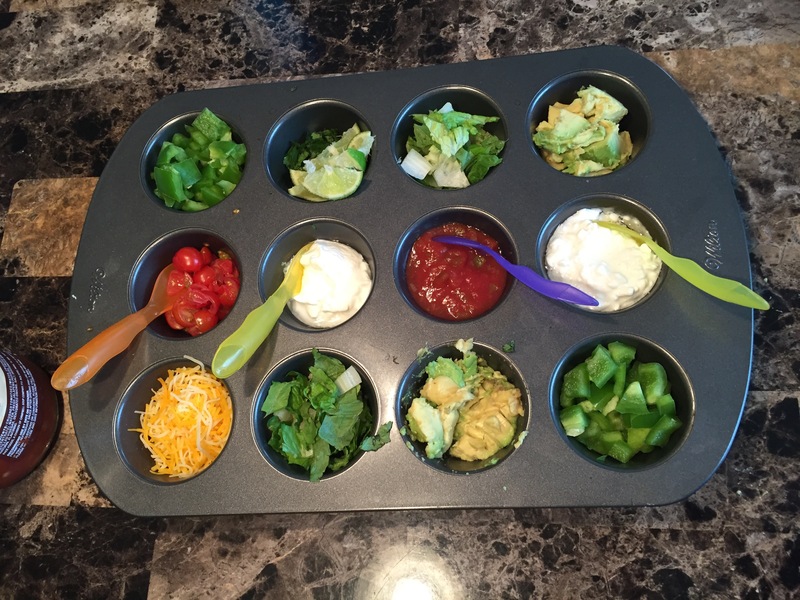 We decided to do our take on “make-your-own-taco” night and it was awesome! I have been reading a lot about how to get kids involved and make them feel independent at the same time. I saw a post about letting kids make their own sandwiches on Super Healthy Kids and thought, why can’t it be tacos? I’m so glad I did. 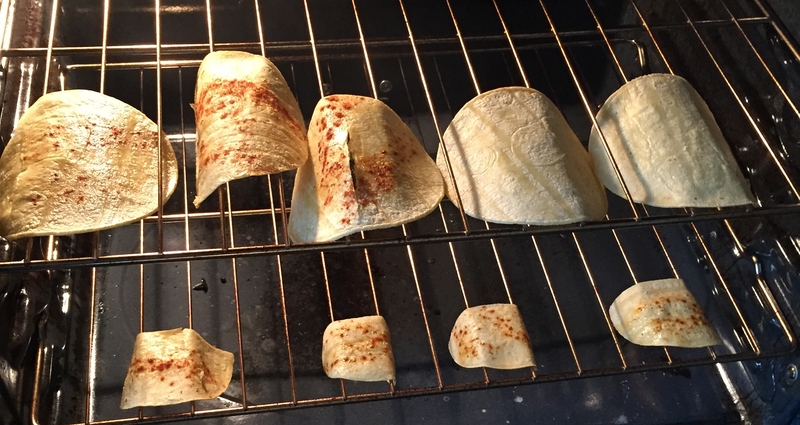 I even made our own taco shells. All you have to do is warm the tortillas just a bit in the microwave (no more than 30 seconds) and then spray both sides of a tortilla with cooking spray. Lay them in a preheated oven at a temperature of 375. Place the tortilla over two of the bars of the oven rack as shown and bake for 8 minutes or until crispy. This makes awesome shells and because of the rack makes them stand up on their own which is great for little hands. I also cut the tortilla in half before I baked them so they could have mini tacos making it easier for them to have full control. Something as simple as choosing what they put on a taco can do wonders for their self-esteem. 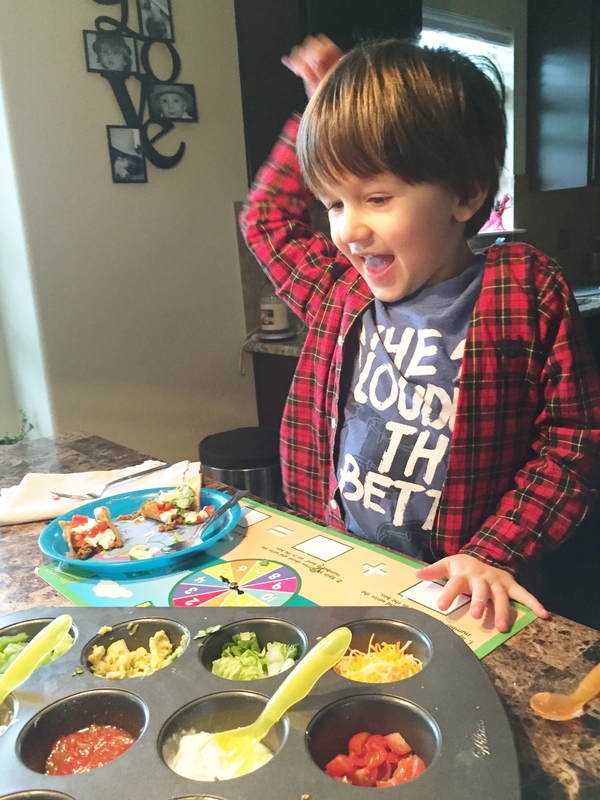 They were so excited that they created their dinner that there was not a single complaint. I think they thought their own taco creation was the greatest thing they had ever tasted because they made them themselves. They devoured them and wanted more! Hooray! Our teaching lesson this time was naming and recognizing the ingredients. We would name the ingredients as they filled up their tacos. They put everything I put on the cupcake tray on their taco which made me happy as they were mostly veggies. 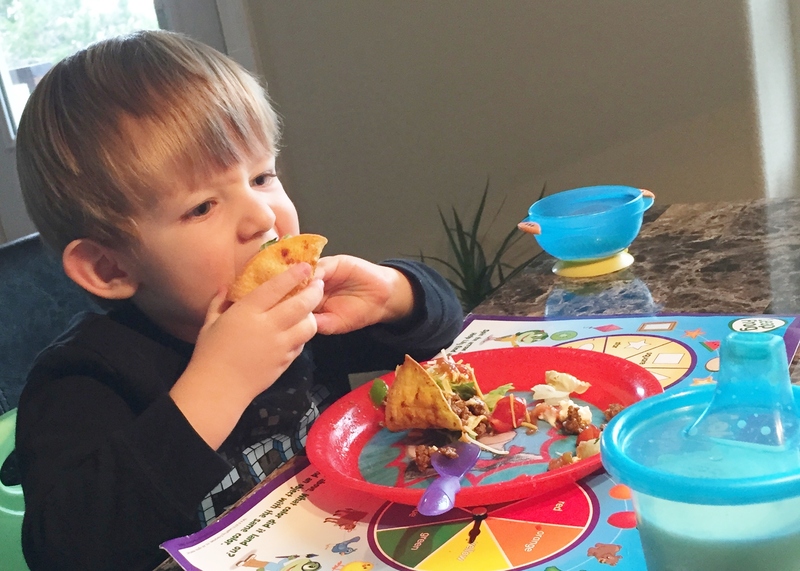 There is a a game the boys like to play in the kindle which also reviews foods as a guy eats them and says “gracias” (thank you) and then makes munching sounds every time he gets food. 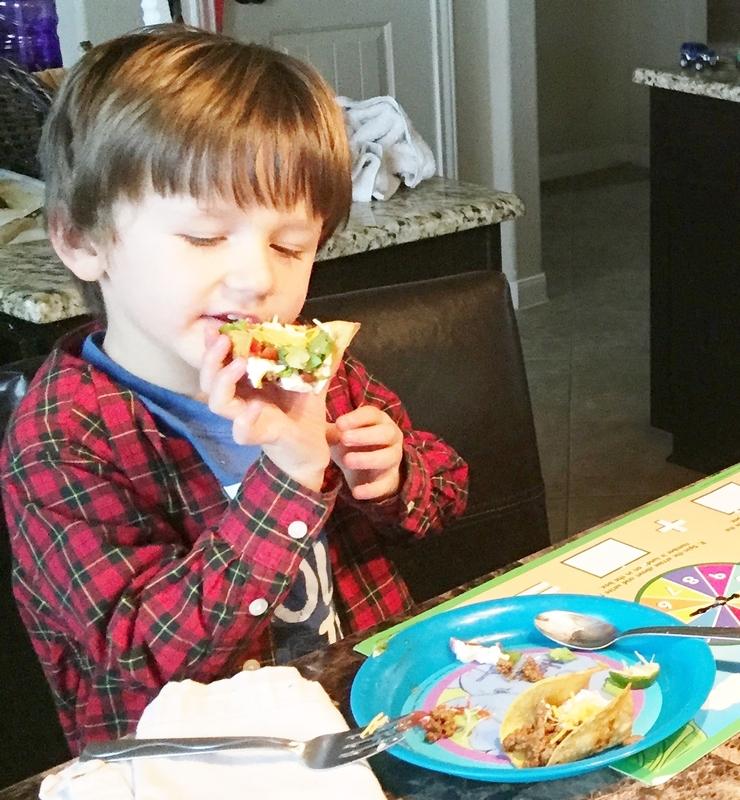 My little one loves this game and at dinner said “gracias” and munched every time he took a bite. Now that is a compliment in my book! All in all, I feel amazing about the day. We shared, we learned, we grew, we ate good food. I have to find a way to keep this going. Any suggestions?